While I am in Ames, Iowa for the Iowa Music Educators Association Professional Development Conference, I have had the chance to stop by Best Buy (I needed to buy another VGA dongle for my MacBook, as my regular dongle was missing), Wal-Mart, and Target. Target had the brand new Barnes and Noble Nook HD tablet for sale. It’s a beautiful tablet that is very light, and it is incredibly priced at $269. If you have a Target Card (Credit or Debit), you would get another 5% off that tablet. 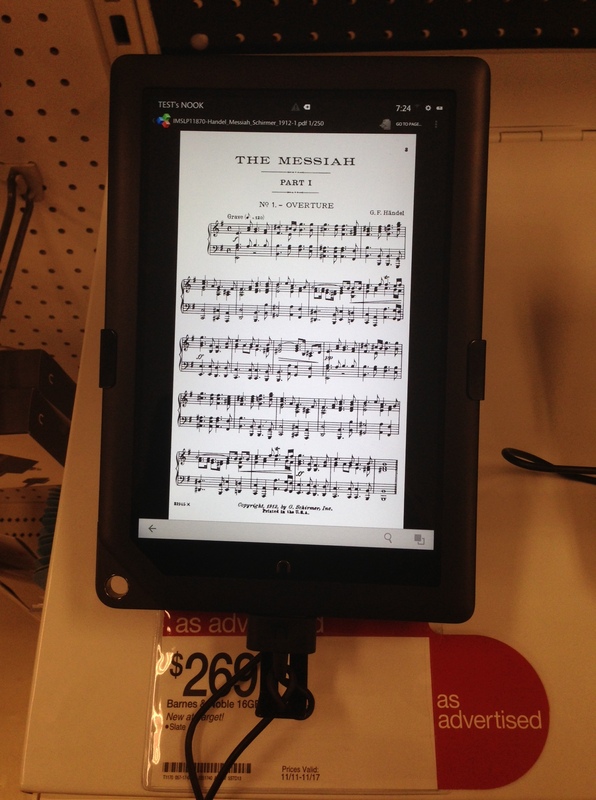 The Ames Target has guest wi-fi available, so I was able to connect to the Internet (the device had not previously been connected to the Internet) and to surf the web and even load my usual test score, the G. Schirmer Vocal Messiah that is available from IMSLP. The only problem with the Nook HD is that it doesn’t have the App resources of the Kindle Fire, the Android Tablets, and of course, the Apple App Store. Other than that, it’s a wonderful tablet. If you need a tablet for e-mail, surfing the web, reading books, and watching movies…it is definitely worth looking at over all of the other Android Tablets (including the Kindle Fire) and even the iPad Mini. At the same time, if you would want to use this tablet for music, you are going to be disappointed. Although EZ PDF Reader, a passable program for music use with Android devices, is available for the Nook HD, I fear that it will not handle page turns well. As I mentioned, I loaded the Messiah on the device (having to use Quick Office to display it) and the results were a bit disappointing. You can see the results in the picture attached to this post. I would NOT recommend this device for use as a music reader. What the Nook HD Tablet needs is an app like forScore or unrealBook. It’s unlikely any developer will invest in such an endeavor, because the device won’t have the sales numbers to justify such an investment. But if you know someone who just needs an Internet connected tablet–this is a great one.